We can not stress enough the importance of recognition and praise in personal and professional endeavors. Feelings of pride, achievement and self-worth are the main drive for improvement in production and performance. Academic programs focus on recognizing achievements of top students, faculty and researchers within the academic domain. The main objective is to encourage further advancements by providing praise, visibility and acknowledgement of superior academic achievements. Successful academic recognition programs boost student moral and make others strive to accomplish milestones of their own. It provides higher levels of self-confidence of the top students and faculty. May we recommend the following crystal awards that are perfect for academic recognition programs. 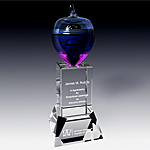 The crystal apple award comes in two sizes and features a unique art glass apple sculpture of multiple colors. This award is often given to educators, research and faculty. 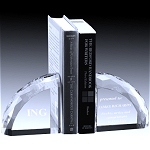 We also suggest our crystal book award, with it’s classic design it has been a best selling crystal award for years. The crystal book award features a generous etch area and can accommodate extensive verbiage. The crystal book award is perfect for students and faculty. Another popular education crystal gift is our set of faceted bookends. These crystal bookends make a perfect heirloom for those who are avid readers. Each crystal bookend in the set can be personalized with a meaningful message recognizing either years of service or other special achievement. Our crystal bookend set also makes a perfect retirement gift for teachers, researchers and other members of faculty. And lets not forget about our great selection of crystal graduation gifts. Commemorating such a great accomplishment as academic advancement with a crystal heirloom has become a tradition in many academic establishments. For example, a graduating class of the medical school receives a parting gift of a crystal clock or a crystal paperweight. The crystal gift features school logo and it will be proudly displayed on the desk of the graduate as a nostalgic reminder of their school days. The gift also reinforces the connection to the alma mater and the alumni will always carry that connection in their hearts.